"To be born innocent is natural, but to die pure of heart�that's a gift!" Just because a film possesses a few Christmas scenes and dates back more than 30 years doesn't automatically make it a "holiday classic." Yet the folks at Fox hope to profit from the average moviegoer's ignorance of Hollywood history (and soft spot for yuletide yarns) and hoodwink us into believing Beyond Christmas is one of the genre's all-time greats. Too bad truth-in-advertising isn�t a Christmas tradition; if it were, A. Edward Sutherland's shamelessly sentimental film would be released to home video under its original title, Beyond Tomorrow. Then again, without its tenuous Christmas connection, it's highly doubtful this 1940 antique would be making its DVD debut at all. A cross between Here Comes Mr. Jordan and It's A Wonderful Life (and produced prior to both), Beyond Christmas concentrates more on religious themes than holiday cheer. Oh sure, the lengthy opening scene takes place on Christmas Eve, but the bulk of the film tells a typical love story peppered with overtones of redemption and renewal, a few guardian angels, and inspirational platitudes galore. Screenwriter Adele Comandini spreads a thick layer of syrup, but honest performances by a trio of old pros reduces the saccharine to a palatable degree. Charles Winninger, C. Aubrey Smith, and Harry Carey portray aged business partners who decide to test the nature of mankind on Christmas Eve. They stuff $10 bills in three separate wallets, then toss them one-by-one onto the snowy New York City sidewalk outside their townhouse and wait to see if any good Samaritans return them. Two loners do�James Houston (Richard Carlson), a struggling Texan singer with boyish good looks, and Jean Lawrence (Jean Parker), a pretty yet shy young woman who works at a children's clinic. Both welcome the chance to spend Christmas Eve with the jovial old men, who take them under their wing and watch with paternal pride as sparks fly between them. Romance develops, and James and Jean soon become engaged, but tragedy tempers their joy when a plane crash kills their three dear friends. Or does it? The trio returns to New York as ghostly spirits, so they can look after James and Jean, whose relationship soon encounters some unforeseen obstacles. After James achieves overnight success as a singer, he's hired for a new Broadway musical, but the trappings of fame and his sultry leading lady (Helen Vinson) lead him astray. His romance with Jean crumbles, and it becomes clear James needs celestial intervention to steer him back on the right path. Beyond Christmas works hard to wring tears and warm the cockles of viewer hearts, but its reliance on cheap sentiment and dated (even for 1940) contrivances keep our emotions in check. Some old-fashioned charm perks up the proceedings, but can't disguise the modest production values, heavy-handed script, and lame special effects. Still, Winninger, Smith, and Carey bring considerable professionalism and lovable whimsy to their heavenly roles, while Carlson and Parker make attractive and engaging ing�nues. And let's not forget the crusty and always priceless Maria Ouspenskaya, who provides some welcome exotic zing as�what else?�an elderly Russian countess. Films about angels are supposed to be frothy, lighter-than-air confections, but like supermarket eggnog, Beyond Christmas is leaden and cloying. Ultimately, the screenplay's simplistic treatment of such weighty issues as forgiveness and redemption lends the movie a sappy triteness it just can't shake. And with such a flimsy Christmas connection, only those desperate for yet another seasonal tale will care for this bland holiday wannabe. Image Transfer Review: Fox includes both colorized and restored black-and-white transfers on the single-sided disc, but purists beware; the studio buries the black-and-white version in the special features section, rather than allowing viewers to choose their transfer up front. As a result, the disc defaults to the colorized version, which features pinkish fleshtones and an overall fuzzy image. Sometimes the color washes out during dissolves, and backgrounds are occasionally left undyed. The same source material seems to have been used for both transfers, and it's a pretty banged up print, with lots of marks and scratches, some shaking, and a few choppy transitions that suggest missing frames or even missing sections. (See the Extras Review for a theory on the latter.) Contrast and shadow detail are weak, and though the black-and-white version looks slightly better, murkiness pervades it, making details difficult to discern. (In addition, no chapter stops are available on the black-and-white version.) If this is a restoration, I shudder to think what Beyond Christmas looked like in its original state. Audio Transfer Review: The two-channel mono track exhibits all the imperfections that typically plague vintage films�thin, hollow sound, intermittent pops and crackles, and underlying hiss. Dialogue is generally easy to understand, but the overall audio is flat and lifeless. Extras Review: A few Vintage Holiday Extras (totaling seven-and-a-half minutes) kick off the special supplements and include two public service announcements from the National Tuberculosis Association (one featuring a young Bob Hope), and a Christmas-themed war bonds sales pitch from Bette Davis. The latter is unintentionally hilarious, as it shows Davis breaking the news to her disappointed "children" that she's giving them war bonds for Christmas instead of presents! A trailer for Beyond Christmas produced especially for this DVD, as well as one for another Legend Films release, A Christmas Wish (better known as The Great Rupert) starring Jimmy Durante, follows. Five minutes of "deleted scenes" come next, but they seem to have been deleted when the film was recut for television many years ago. 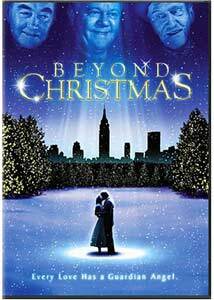 Beyond Christmas is listed on the Internet Movie Database as running 84 minutes, but this DVD version lasts only 79 minutes, which would account for the missing material. Why these scenes couldn't have been edited back into the film remains a mystery, but their insertion would have restored the film's natural flow. Two of the sequences are superfluous, but the others nicely flesh out the pivotal relationship between Helen Vinson's character and her ex-husband, adding layers to both characters and making the story's climax more plausible. Beyond Christmas isn't really about Christmas at all, and though it contains moments of charm, it's merely a dated, low-budget weepie wrapped up in misleading holiday packaging. With so many bona fide classics lining up for their traditional seasonal spin, don't hesitate to let this insipid inspirational tale languish on the shelf.